Trial for Bigamy is mentioned in Pamela Gerrish Nunn’s Problem Pictures: Women and Men in Victorian Painting (1995, p. 65). Nunn contrasts various paintings of the 1880s and 1890s depicting relationships between men and women, which she describes as ‘chocolate-box vignettes, vapid pot-boilers … escapist … flip’, with Crowe’s more serious work. Trial for Bigamy depicts a contemporary rather than historical or fictional event, and uses realistic details and muted colours; by these means, ‘the adversaries are brought out of the assembled crowd enough to assist the narrative but not so as to melodramatize their roles’. 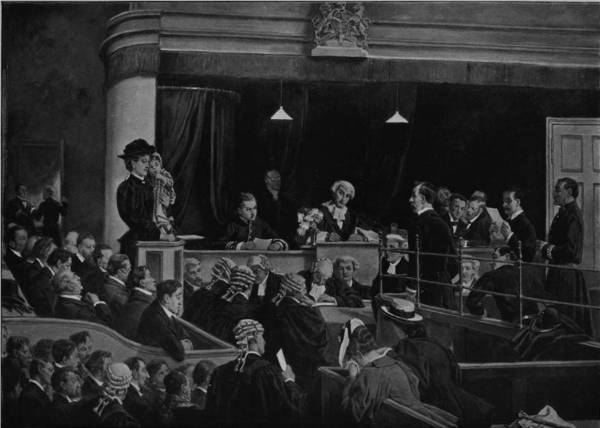 The picture was based on the Crown Court in the Town Hall at Leeds, which Crowe had undoubtedly visited during one of his trips to the north as an Inspector of government art schools. The visitor who is enquiring after novel bits of genre in this exhibition will find that Mr. Eyre Crowe has hit upon a new and telling subject for his most important work of the year, a comparatively large representation of a Trial for Bigamy (No. 580) in an English court. The first wife, a comely young woman with a child in her arms, is in the witness-box, and nervously gives evidence against the culprit, who does not seem to like his position. The second wife and a sympathetic friend or sister are seated in the lower part of the court; the former hides her face in her handkerchief and weeps silently. The jurymen differ as much as they ought to differ, and every face in the box is full of character; and so are the queer visages of the ‘public’, all of them more or less unwashed and vulgar. The tragi-comedy of the subject has been sympathetically studied; there are traces of humour here and there, not a little satire, and plenty of spirit… The rough surfaces and somewhat opaque colour of these pictures are unfortunate, and tell greatly against them. Mr Eyre Crowe’s ‘Trial for Bigamy’ (no. 580) is just the kind of picture which the enemies of the Academy quote and requote in their diatribes about the hanging on the line and the rejection of outsiders’ works. The picture is certainly an awful example to the would-be Bigamist.